PUTRAJAYA, 9 October 2014 – About 170,000 borrowers of the National Higher Education Fund Corporation (PTPTN), including those from The National University of Malaysia (UKM) will be given an opportunity to negotiate with the corporation on how to repay their outstanding loans before their names are included in the Central Credit Reference Information System (CCRIS). 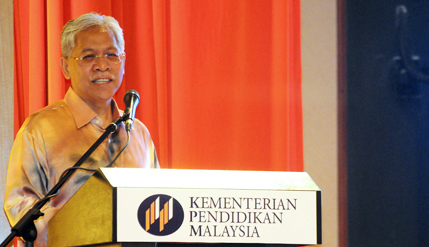 Education Minister II Datuk Seri Idris Jusoh (pic) said PTPTN had been very flexible to the loan defaulters but many had taken advantage of its flexibility by not making any payment at all. “When we implement the system, we will give the borrowers three months to discuss and make payments before their names are listed in the CCRIS, “he said. “We have the details of the borrowers and know that some of them are well paid but have avoided coming to PTPTN for years to discuss with us or make any kind of payment,” he told reporters after handing over grants of the Malaysia Laboratories for Academia-Business Collaboration programme to research universities at the Education Ministry here today. He was asked to comment on the possible measures to be initiated by PTPTN to recoup payments by listing the stubborn borrowers in the CCRIS. A report said in the initial stages the CCRIS will be imposed on 170,000 stubborn borrowers who have not made any kind of payment to settle their loans amounting to about RM1.2 billion between 1998 and 2010. Idris said PTPTN is willing to discuss the mode of repayment, depending on the borrower’s capability before tougher action was taken. Earlier, he presented letters of award for the Higher Institution Centre of Excellence programme (HICoe) to the country’s outstanding researchers whose achievements have been recognised by Thomson-Reuters.